Kings Of Leon are finally - finally! - bona fide stars in the US. Their latest album, Only By The Night, has been certified platinum by the RIAA, for shipments of one million units in America. For the Nashville-based band, who have sold millions internationally since their 2003 debut, The Holy Roller Novocaine EP, it's sweet relief to achieve success in their homeland - and to celebrate, they've just announced a headlining arena tour of the States. 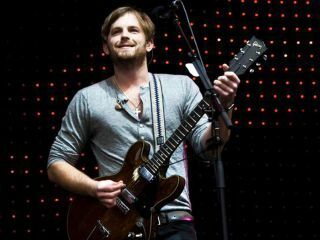 Kings Of Leon will start their North American trek on 7 August with a bill-topping performance at Lollapalooza in Chicago and end the run on 24 October in Monterrey, Mexico. "I always had a feeling that they could go big," says Ken Weinstein, co-owner and co-founder of Big Hassle Media. Weinstein has been the band's publicist since 2002 - "I first saw them in a basement, and even they they killed" - and although he felt in his heart they were bound for greatness, he knew it might be an uphill climb. I realized, if they get there - or when they get there - it'll probably happen the old-fashioned way: word of mouth, touring, with each record getting bigger than the last one." Working with the group, Weinstein says he grew committed to their cause. "Talking with them, hearing their stories, how they grew up, seeing their outlook on life and how seriously they approach their music, it made me believe in them 100 percent." "To experience this moment, going Platinum in the States, it's kind of an indescribable feeling," says Weinstein. "The band have always been grateful to all of their fans everywhere in the world. But this is incredibly gratifying." Weinstein says the band should be hitting the studio "sometime in 2010" to record their follow-up to Only By The Night.